I was just listening to a conversation on MSNBC about Texas Democratic Senate candidate and U.S. Representative Robert "Beto" O'Rourke (below) and how he's faring in his campaign against the insufferable Ted Cruz. Despite raising more than $38 million for his campaign from voters all over America, he's behind Cruz by eight percentage points in the polls. A pair of political strategists, one Republican and one Democrat, agreed that O'Rourke is impressive at inspiring people nationwide but, because Texas has not sent a Democrat to the Senate sine Lloyd Bentsen won his fourth and final term in 1988, always had an uphill battle. The Republican strategist even said that Democrats wanted their money on a lost cause when their continuations could have gone to held imperiled Democratic Senate incumbents. That is, Beto has more support outside Texas than in Texas. 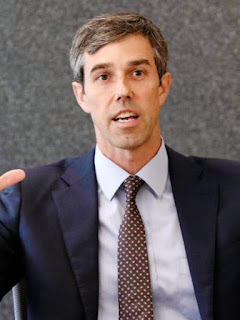 He added that O'Rourke made a fatal mistake by nationalizing the race instead of talking about issues primarily concerning Texas, reminding Lone Star State voters that there is something worse than Ted Cruz, the least liked man in the Senate - a Democrat. Former Democratic U.S. Representative Donna Edwards, responding to the strategists seemed to concede that O'Rourke will lose (like O'Rourke, Edwards gave up a House seat for a quixotic quest for a Senate seat), but she did say that the enthusiasm he's generated in Texas may help Democratic House candidates there. As for the polls . . . well, I think there's a chance that Cruz could be upset in Texas, just as his fellow Cuban-American senator Robert Menendez could be upset in New Jersey (more on that later). The polls don't show first-time voters in their surveys, and the young people in Texas fired up by O'Rourke could end up making the difference. But if he loses, he is likely politically dead, like so many one-time losers on the Democratic side who have come before, and coming from El Paso and having a rapport with Hispanic voters will only help Beto if a future Democratic President appoints him to a Cabinet position.